London’s Glittering Home of the Premiere Returns: ODEON Luxe Leicester Square to Reopen Following Multi Million Pound Luxe Upgrade and Introducing the UK’s First Dolby Cinema | Dolby Laboratories, Inc.
LONDON--(BUSINESS WIRE)--Nov. 7, 2018-- Europe’s most famous cinema, London’s ODEON Leicester Square, will reopen this Christmas following an 11-month, multi-million pound Luxe refurbishment that has transformed the UK’s ‘home of the premiere’ back into a global icon in the heart of London’s West End. 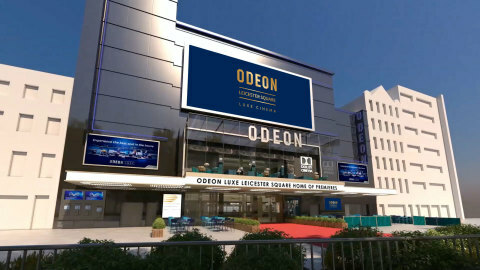 ODEON Luxe Leicester Square will be the European flagship for Odeon Cinemas Group, Europe’s largest cinema operator, an AMC Entertainment company. The reborn and lovingly restored cinema blends the historic glamour and charm of the original venue (first opened in 1937) with state of the art luxury and technology. Home to hundreds of premieres, the building’s largest screen has been fully upgraded to combine luxurious reclining ODEON Luxe seats with the captivating experience of Dolby Cinema. ODEON and Dolby have partnered to offer film fans the UK’s first Dolby Cinema experience. Combining dramatic imaging that delivers a spectacular, leading-edge visual experience through the Dolby Vision dual laser projection system and moving audio which fills the cinema and flows all around you with Dolby Atmos, every person will get a truly immersive and unforgettable cinematic experience, no matter where they are in the 800-seat auditorium. 800 guests will enjoy luxury seating throughout, including over 350 powered Luxe recliners offering extensive legroom, sumptuous comfort and personal tray tables. All 800 seats have been designed to give guests the perfect comfort and viewing experience. Screens 2-5 at ODEON Luxe Leicester Square have also received full refurbishment to offer an exclusive, intimate experience for 116 guests with luxury seating. The full interior makeover transforms the cinema into a stunning leisure and entertainment venue. A bespoke new lift and escalators improve access and enhance the beautiful contemporary art deco design. The building’s famous heritage features have been lovingly restored including the Flying Ladies and original Compton organ in the premiere screen, a breath-taking mirror wall created for the digital age, and auditorium doors that pay homage to decades of Royal and world premieres. The opulent new Oscar’s Bar (named after ODEON founder Oscar Deutsch) will serve an extensive range of drinks, including champagne and cocktails, and offer guests stunning views across Leicester Square from the bespoke new glass enclosed balcony. ODEON Luxe Leicester Square is the first Dolby Cinema to open in the UK following a deal announced in June 2018 by Odeon Cinemas Group and Dolby Laboratories to bring 7 new Dolby Cinemas to ODEON in the UK. ODEON launched its first ODEON Luxe cinema in October 2017 with recliner seats in every screen, full luxury refurbishment to the whole cinema, plus a new food and drink retail offer including an Oscar’s Bar, and signature guest service. Eleven ODEON Luxe cinemas are now open across the UK, with more to come this year and in 2019. Odeon Cinemas Group is Europe's largest cinema operator, with leading positions and brands in the UK & Ireland, Spain, Italy, Sweden, Finland, Estonia, Latvia and Lithuania; and a strong presence in Norway, Germany, Austria and Portugal. Odeon Cinemas Group is an AMC company; AMC (NYSE:AMC) is the largest movie exhibition company in the U.S., in Europe and throughout the world with more than 1,000 theatres and nearly 11,000 screens across the globe. In Europe, Odeon Cinemas Group welcomes over 115 million guests each year to enjoy great hospitality while watching the latest films and entertainment in more than 360 cinemas and 2,900 screens. The Group is proud to be at the forefront of innovation by investing in fully reclining seats and offering a wide selection of food and beverage choices to create the ultimate guest experience. ODEON is the Group’s brand in the UK & Ireland. With more than 120 cinemas, over 950 screens and 87 years of cinema experience, ODEON is the largest cinema exhibitor across the UK & Ireland. With more than 5,700 colleagues employed across the UK & Ireland, ODEON has once again been placed number 25 in the Sunday Times Best Big Companies to Work For 2018 and named a Best Large Workplace in Ireland 2018. Dolby Laboratories (NYSE: DLB) is based in San Francisco with offices in over 20 countries around the globe. Dolby transforms the science of sight and sound into spectacular experiences. Through innovative research and engineering, we create breakthrough experiences for billions of people worldwide through a collaborative ecosystem spanning artists, businesses, and consumers. The experiences people have – in Dolby Vision, Dolby Atmos, Dolby Cinema, Dolby Voice, and Dolby Audio – revolutionize entertainment and communications at the cinema, on the go, in the home, and at work.